There are many types of flooring; you can choose one based on your needs and desires. All flooring falls into one of two categories: it’s either a floor covering that’s easily installed and removed, or it’s a structural installation. 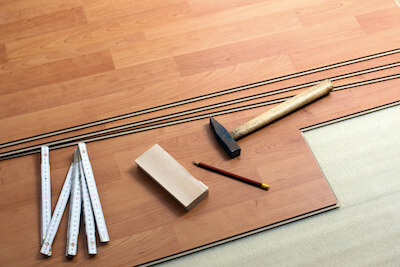 There are three types of flooring that provide structural installation: hardwood, ceramic tile, and stone. If you don’t choose one of these flooring options, you won’t impact the structure of your room. Solid wood, ceramic tile and stone flooring all become a part of your home’s structure. They are considered permanent flooring. And because of that, they will also add a structural value to your home as well. Floor coverings are anything but hardwood, tile, and stone. They are engineered wood, laminate, luxury vinyl, carpet, vinyl and anything else. They aren’t part of the home’s structure, even when you staple or glue them into place. And while they may create aesthetics and ambiance in your home, they will never be considered permanent flooring. Why is this important? It depends on what you hope to achieve with your flooring product. If you want to add value to your home, the best way to do that is with permanent flooring. Structural installation of a flooring choice will do that. You should also expect to pay more for a permanent flooring choice, and realize the process of installation will take more time. Is engineered wood a permanent flooring choice? While engineered wood is designed to give the appearance of hardwood, there are still many differences between engineered and hardwood. And because engineered wood has a limited lifespan when it comes to maintaining and refinishing in, from a structural standpoint, it’s simply a cover to the plywood subfloor. Is one flooring better than the other? It’s all a matter of opinion. Just like we choose décor to match our moods and needs, the type of flooring we install should also address our desires. Make sure you understand what role you wish your flooring to address – to add to the structural value or to just look nice – and choose accordingly.